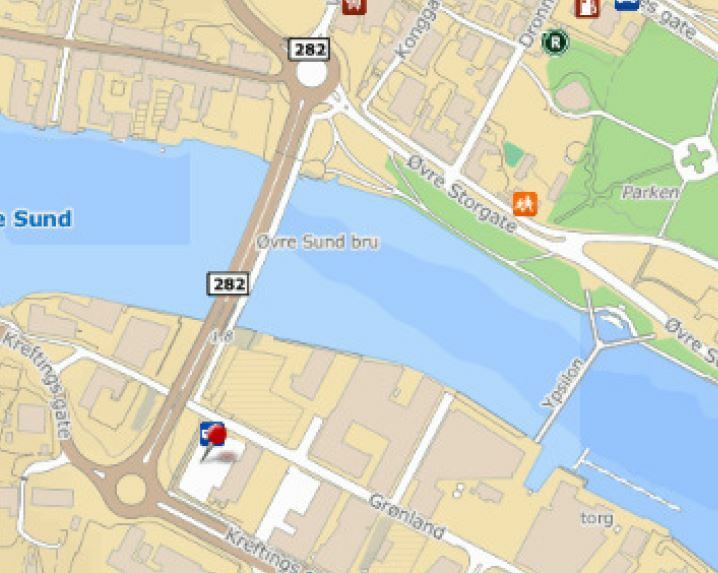 Solsmaragden (the Solar Emerald) is located in Drammen (59.74°N, 10.19°E) in East of Norway. 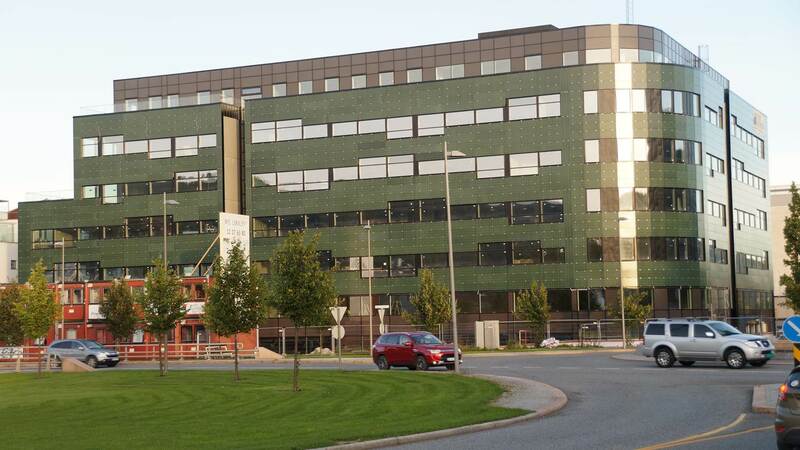 This is a commercial building owned by Union Eiendomsutvikling and holds office space for around 450 people (BRA 8650 m2). The building owner wanted to achieve the highest energy mark (Energiklasse A and passivehouse standard NS3701) and to realize outstanding environmentally friendly architecture. An overview of the building site is shown below. The BIPV panels replace other exterior cladding on the building, and have been taylor-made for this project. The basis is standard 6'' mono-crystalline silicon solar cells in a frameless glass-glass configuration (antireflective tempered glass, 4 mm thick front and back). However, the front glass has been printed on the inside with a pattern of green coloration. The pattern can be seen in the detail photos below. 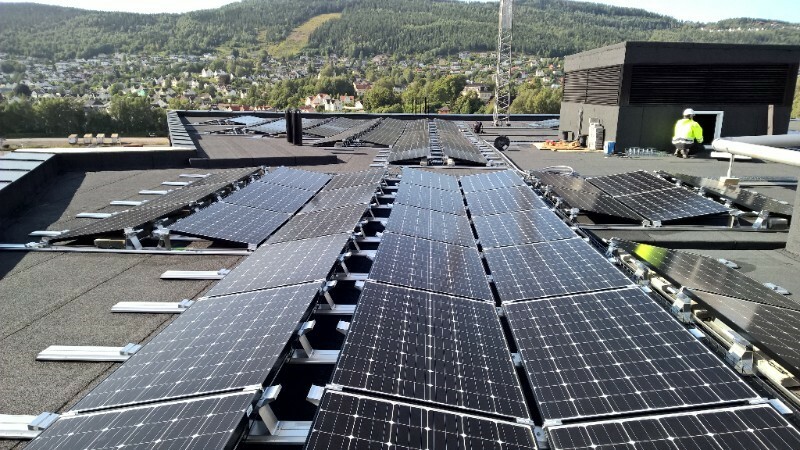 The panel design and the fastening method was developed as a collaboration between the building owner Union Eiendom and the project architect, under guidance from the Norwegian PV supplier FUSen. The panels were produced by the Belgium office of Issol and installed by the building contractor Strøm Gundersen. 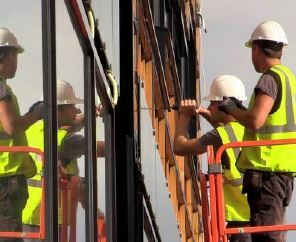 Standard brackets for facade glass mounting were used to fasten the PV panels to the battens of the climate wall. 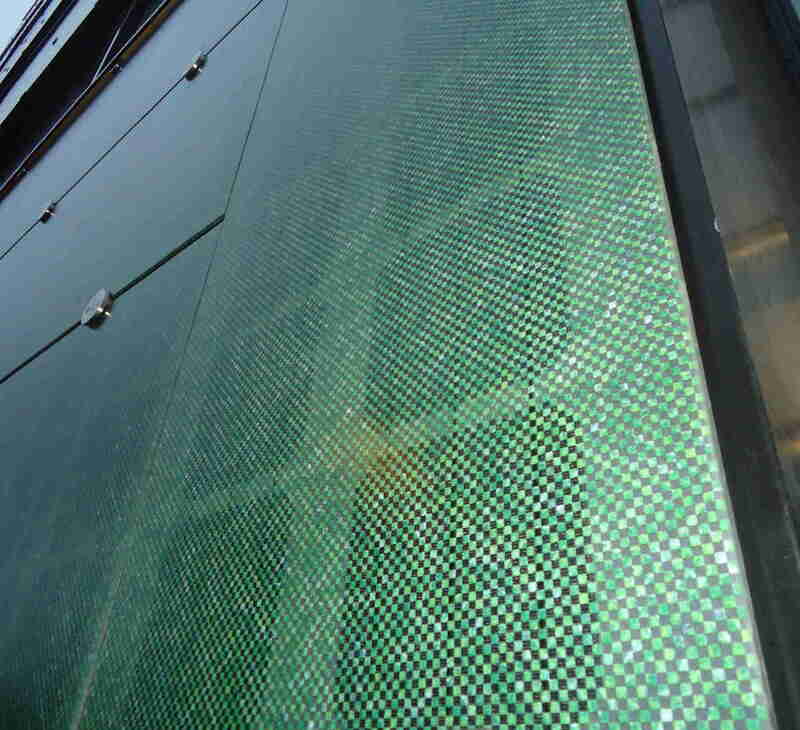 The material choice and installation method ensure that panels will not fall down in the case of glass breakage, which is in compliance with national standard safety requirements for a glass facade. 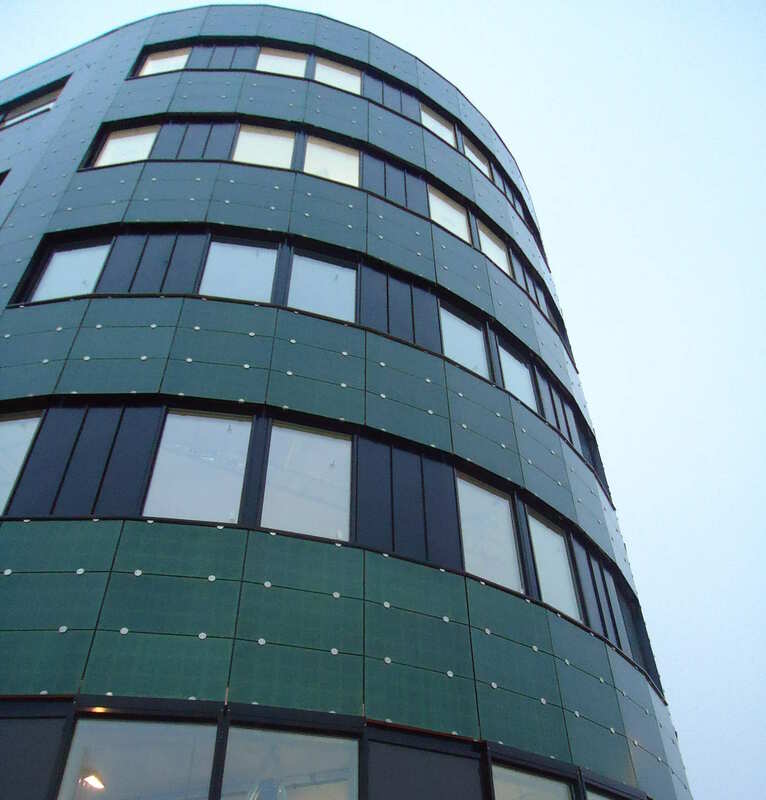 The main lesson learned from this project was that this type of taylor-made BIPV facade is still rather costly, and not many suppliers of colored BIPV products can be found on the European market today. 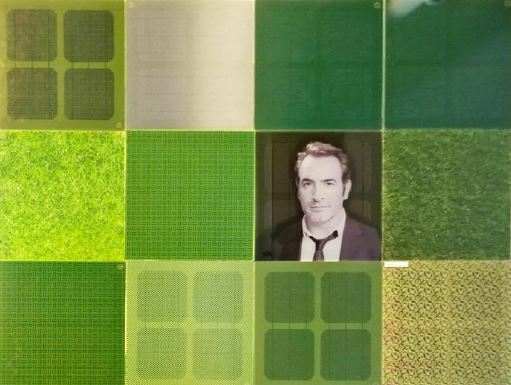 The colored-PV technology is not well developed, and this is a topic of research in the ongoing BIPVNO project (see WP4) as well as for the Norwegian Research Centre for Sustaiable Solar Cell Technology, starting up in 2017. 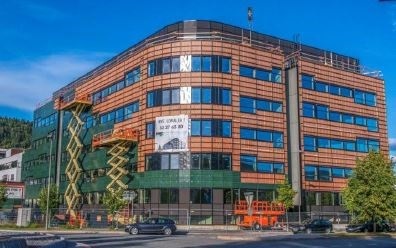 As the solutions offered by foreign suppliers for installation of glass-facade PV panels were costly and not suited for Norwegian building methods in terms of safety requirements, and no national suppliers existed, FUSen decided to collaborate with the company Issol in Belgium to develop a suitable solution. 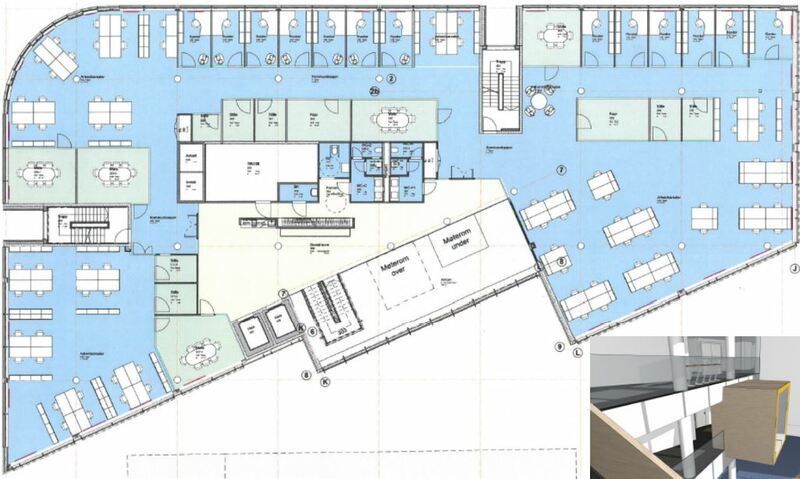 The project architect was defining the premises for the appearance of the panels, and by using the printed glass method, the choice of patterns and colors was almost limitless (see examples in the figure below). In the end, a new technology was developed to satisfy requirements for cost, appearance and installation method. The reduced cost released support from the public enterprise Enova as part of the program for demonstrating new technology. Other important lessons learned included the need for focus on details (for instance the installation sequence and the string design, which was a "BIPV jigsaw puzzle"), the importance of doing things right the first time (as the correction of errors is difficult and costly), and the need for close collaboration between all parties during the whole building process (architect, building owner, consultants, engineers, funding bodies, etc.). The system is not instrumented for collection of detailed monitoring of electricity production or weather data. PV production may be analyzed based on available data from the inverters. Irradiation data may be collected from a nearby weather station in the attempt to estimate system efficiency and performance ratio, however, such calculations are uncertain and complicated due to the shape/orientation of the BIPV system and the lack of local sensor readings. Solsmaragden is equipped with BIPV on all facade orientations, as well as a traditional BAPV system on the roof. The BAPV system was set in operation early in 2015 in order to provide power also during the building period. The BIPV facade system consists of in total 1011 panels (1242 m2), with a total installed capacity of 115.2 kWp. The panels are distributed with 423 panels on the West facade, 372 panels on the South facade, 205 panels on the East facade, and 11 panels on the North facade. The architectural integration required 22 different types of PV panels. The string-layout was carefully designed to take into account the different irradiation conditions and BIPV panel sizes on the different building facade walls. 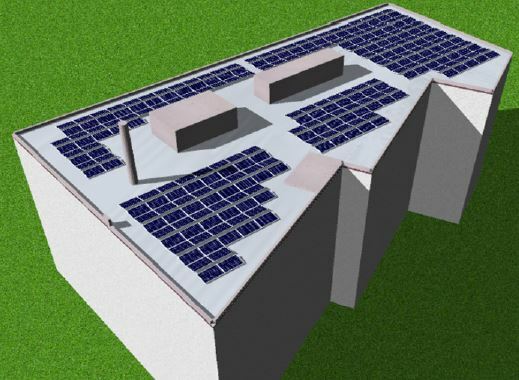 The BAPV rooftop system consists of 242 panels (388 m2), with a total installed capacity of 67.8 kWp. These panels are standard 1 m x 1.6 m mono-crystalline silicon panels from IBC (280 Wp), with 3.2 mm front glass and a Tedlar film on the back. The panels are mounted in an alternating East-West configuration (Azimuth 115°/295°) with a tilt angle of 10°. The PV strings are connected to 13 SMA inverters in the range 3-25 kW, in total 166 kW AC (i.e. : 1 x 3 kW, 1 x 5 kW, 2 x 6 kW, 2 x 10 kW, 2 x 12 kW, 1 x 15 kW, 1 x 17 kW, 1 x 20 kW, 2 x 25 kW). The total installed PV capacity is 182.9 kWp DC, and is estimated to produce 106 MWh annually (55.5 MWh from the facade and 50.5 MWh from the roof). The PV production (BAPV and BIPV) will contribute an estimated 23 % of the total building electrical consumption. The expected specific yield is 580 kWh/kWp (BIPV+BAPV). 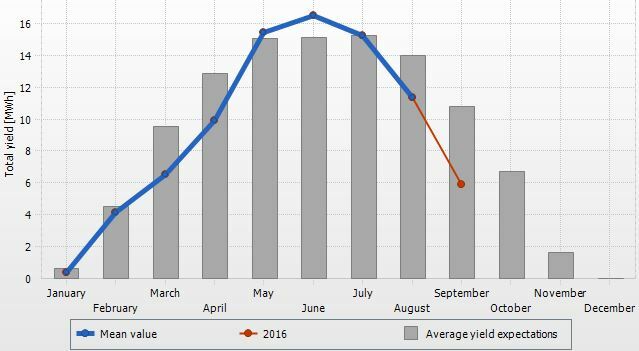 Based on the first months of production data available, the actual yield is close to expectation, with slightly lower values in spring and slightly higher values in summer. However, longer time series over several years should be used to include effects of natural weather variations and long-term system performance and reliability. The figure below displays the monthly production (AC from the inverter) of the PV system at Solsmaragden per mid-September. The table gives the annual production and specific yield based on the collected data (not yet available: Data have been registered from January 2016 onwards). The performance of the facade is affected by shading from (i) company signs mounted on top of some parts of strings, (ii) neighbouring buildings, and (iii) horizon shading from the south and southwest in wintertime. These effects are currently being investigated in more detail. 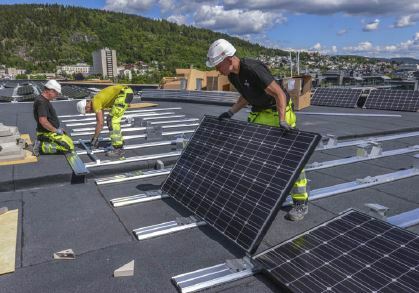 The Solsmaragden project was developed by Union Eiendomsutvikling ("Energibygget") and received funding from Enova - New technology for future buildings.